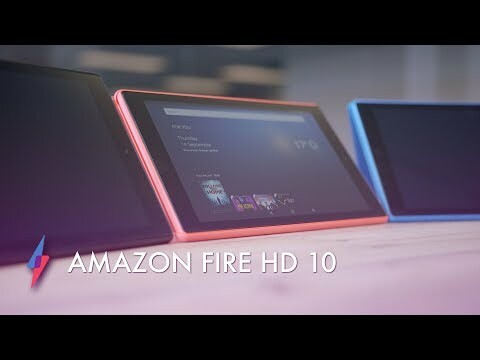 The Fire HD 10 is a new tablet from Amazon that features Alexa Hands-Free mode, Dolby Audio and a 10.1-inch FHD display, among other things, that make it a formidable newcomer in the world of tablets. The Amazon Fire HD 10 tablet features a 10.1-inch 1080p Full HD display. With over 2 million pixels, picture and video quality are better than ever before; video games have sharp details to take your game to the next level. The in-plane-switching (IPS) LCD display is also brighter than previous versions, promoting better picture quality, while also cutting down on glare. Dolby Audio sound is projected by stereo speakers for a vibrant, robust true stereo experience. Watch your favorite movies, TV shows, listen to your favorite music, and play your favorite games with the sound quality the audio engineers originally intended. The Fire HD 10 tablet is 30% faster than previous iterations thanks to its quad-core processor build. It features twice the RAM with two 1.8GHz cores and two 1.4GHz cores. The result is a speedy experience that allows you to play your favorite processor-demanding games without lags or freezing. Wi-Fi is also a lot faster, thanks to the incorporation of dual band 802.11ac Wi-Fi. Dual band Wi-Fi keeps your speed-heavy tasks on one band, freeing up less demanding tasks for the other band. The result is a smoother performance and much better video and music streaming. The Fire HD 10 offers up to 10 hours of battery life for your streaming, reading and gaming needs. With a battery life this long, you can spend your weekends in bed binging on your favorite shows, or relax while reading your favorite books on the beach. There are two basic storage options: 32GB and 64GB. Storage space is expandable via the included Micro SD slot to up to 256GB. This means that if you’re looking for a tablet to act as your main digital storage device, you can safely rest easy in the knowledge that the Fire HD 10 can accommodate your ever-expanding photo and music libraries. And if built-in storage isn’t enough to accommodate your needs, no worries: Fire HD 10 users get free uploads to the cloud, so you never have to worry about running out of storage space for vacation photos. Firstly, I’m glad I got the Fire HD 10, instead of a more compact option. It’s the perfect size to read and watch movies on without being huge and bulky. It’s actually very lightweight and comfortable to use, while still having an expansive screen size, which I like a lot. The visual quality is outstanding. All full HD displays have obviously high definition, but the lighting and contrast on this screen really makes the visuals stand out in this case. It’s great to watch movies and shows that have low contrast, because you can actually see the details. The same is true for games. They look nice and clear, too. Sound quality is also superb. There’s great volume and a respectable bass. It’s obviously not going to match top-tier stereo sound systems, but it is exceptional sound quality for any portable device. The Fire HD 10 is also really fast. I mainly stream movies and TV shows, and I haven’t noticed any lagging whatsoever as I have on a previous tablet I owned. If you’re into streaming, this alone makes the Fire HD 10 worth checking out, in my opinion. It doesn’t come with its own case; you have to purchase that separately. However, many tablet-makers require the same thing, so that’s not a huge deal. There are two versions of both the 32GB model and the 64GB model: “with special offers” and “without special offers”. It’s important to note that “with special offers” means that you get ads on the lock screen. However, some may find the tradeoff worth it, so this is more of a preference call. Q. Does the Fire HD 10 come with a case? A. No, you have to purchase one separately from Amazon or get a third-party compatible case. Q. Can I use it to control my smart home? A. Yes, using Alexa to interface with your smart home is already possible, with many features extant. New and highly desired features are coming soon as well, such as the ability to control security cameras. Q. Are both the 32GB and 64GB versions expandable to 256GB? A. Yes, both are expandable to 256GB via a MicroSD card. The Amazon Fire HD 10 Tablet comes with a free 1-year limited warranty worldwide (unless otherwise noted in the fine print). Optional extended warranties of 1-year, 2-year and 3-year duration are additionally available to purchase for US-based customers. The Amazon Fire HD 10 Tablet provides stunning visuals, great sound and hands-free Alexa mode all in one easy-to-use device. It’s also lightning fast, thanks to its 2GB RAM and dual band 802.11ac Wi-Fi. Prime members get even more perks with integrated instant access to Prime benefits like millions of titles to read, watch and listen to. The long battery life seals the deal and makes the Fire HD 10 truly enjoyable; I think anyone looking into tablets should give it a try.